Zombie Kitten Attack is a cheap movie, and you are its star. You need to dodge radioactive zombie kittens, armed only with your wits and a couple of cheesy B-movie props. Specifically, you have a car that does not go very far and a raygun that does not fire many shots. Zombie Kittens, though, are not very smart and tend to bump into things and explode in their haste to get you. 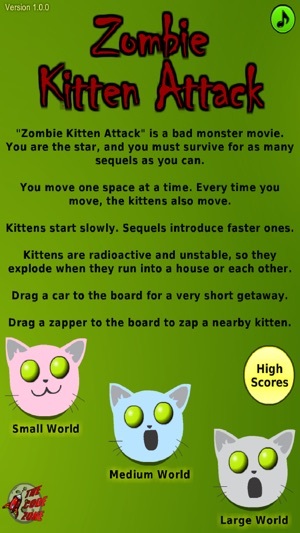 You have no chance against the ever-increasing onslaught of Zombie Kittens, but with a little skill and a little luck, you might be able to survive for a couple of sequels. 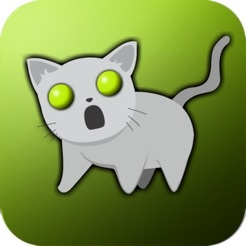 Zombie Kitten Attack is another quick but frustrating little puzzle game from The Code Zone. We're now using a new runtime for stability, security, and maximum compatibility with the latest iOS versions.